While reflecting on the amazing leela experienced yesterday, It became clear to me, that, when the little bird revived and fluttered upward, it carried in its wings, the promise of hope, renewal and immortality. Then to top it all off our divine Baba came in a dream this morning. I remember being on a bus or train with groups of people. I believe I was going to see Swami. Two young Indian men approached me trying to get my attention in a rowdy sort of way. I ignored them and remained inwardly focused. When I got out of the vehicle they followed, still harassing me. I turned around and told them if they didn't cut it out I was going to call Swami. The boys continued bothering me. I called out loudly "Swami! Swami! 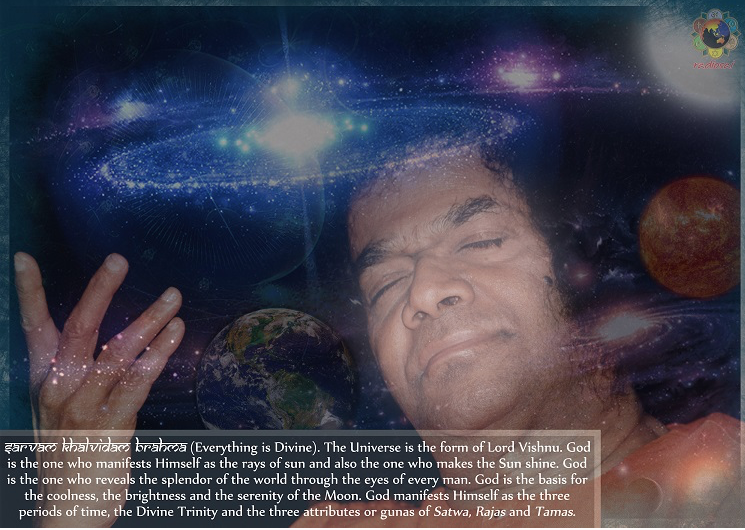 Sathya Sai Baba!" Suddenly, to the left of the road I spotted Sathya Sai Baba engaged in a conversation with some people. He was absorbed in His interaction with them and appeared oblivious to my calls. The boys taunted me, saying, "See... He is not listening to you." Then, Swami got up and walked over to us. He addressed the boys by their names. They were stunned and asked how He knew their names. Swami reached up and pulled some fruit off a tree and handed it to them. Then He asked us all to sit down. We all sat in a row while Swami materialized various substances and gave them to us. One of the boys had hung his name tags on the tree and discovered the tags were missing. ignored him and continued administering to us. There was some commotion and as I looked behind me I saw what looked like wild gorilla looking people making noises. One of them ran over to where we were seated, trying to get Swami's darshan. After this I started waking up. Last night, I had family over to watch the Superbowl, so the energy in the house was to say the least on the wild side. We keep a vegetarian household for the most part, although David eats salmon and sardines occasionally. My family brought their barbecue and ale into the house so maybe that contributed to the dream energy. Perhaps, Sai was helping to clear the rajasic energy left behind.